Note: This page was begun as part of an "online catalog" listing products that were selected to make Christmas more fun for the railroader in your life. Hawthorne Village(tm) features a collection of highly collectible, quality model trains that run on HO track so they fit almost anywhere. However the steam trains, such as those shown to the right, are actually built in O scale, so they would look great with Holiday Villages, such as those from Dept. 56 and Hawthorne Village. Thes trains use reliable mechanisms and other parts from the well-known Bachmann company, so they run like "champs," and service will always be available. But the Hawthorne Village designers add artwork and other detailing that make these trains much more attractive and collectable. That process, in turn, makes every subscription train into a "custom manufacturing job," which means you can’t just buy them at the department store like you can mass-produced trains. Hawthorne Village Subscription Trains are only made for a limited period of time. Basically, the company takes orders for a time, then starts a manufacturing run based on how many orders they have received when they start the run, plus a few more in case of problems, etc. Usually the production runs last only a few months, and no new orders for the series are taken after all the locomotives have been run. That guarantees that the collectors' value remains high (since the run is limited) while guaranteeing that every person who ordered the series before the deadline gets a train. This also means that when a series is closed, it is closed. Some series have remained "open" for many months, because interest was so high. However, the series do close after a period of time, and once they close, it is impossible to get those products directly from the manufacturer, although you can sometimes get them later from collectors who boost the prices. In most cases, it seems impossible to get these trains at all once they've been "closed." In fact, it's harder this year (2005) than it was last year - at least one "speculator" who specialized in buying these sets just to resell them at higher prices has stopped making his collection available for resale at all. When you order a subscription train, you are billed for the first installment, and it is shipped right away, if it's been manufactured already. 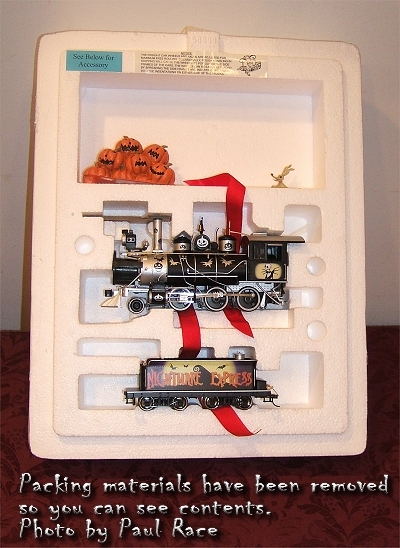 For the Hawthorne Village steam engine sets, such as the Thomas Kinkade Christmas set, the first issue includes the locomotive and tender (coal car). This is an exceptional value, and a bit of a gamble on the part of Hawthorne Village, because the value of the locomotive is substantially more than what you pay for the first installment. But it's not that much of a gamble really, because Hawthorne Village knows that once collectors see the quality of the first installment, they'll want the hand-painted cars that go with it (and virtually everyone does.) About a month later you will be billed for the following installment, a car and some track. 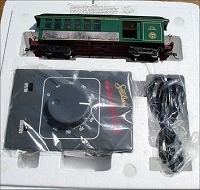 The following month, you will usually receive additional track and the power supply. At that point you have enough of the train to run. If any figures come with the set, they usually come with the fourth installments. At that point, you have, not only a whole "train set," but also a limited edition collectors' item. The installments usually come every 3 or 4 weeks, unless you happen to subscribe while the series is still being manufactured, in which case the wait for the later installments may be longer. Some sets are so popular that the Hawthorne Village people keep making cars as long as demand stays high. Usually every car comes with additional track, and some come with additional figures or other accessories, so you are still getting good value as long as you subscribe. Occasionally you'll receive track plan information to give you ideas for using all the track you've accumulated. This means that if you want to get a train to run at a particular holiday, you should try to subscribe at least three months before that holiday (four is better) to make certain you have enough of the train to run. 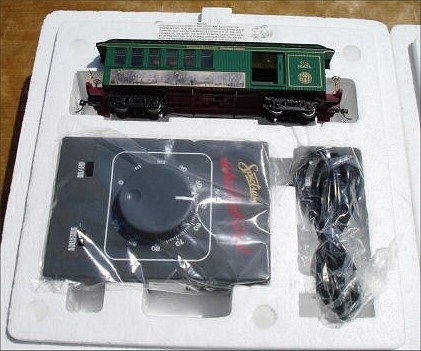 Of course you can also order a Bachmann On30 set to let the kids run while you're waiting for the rest of the subscription train to arrive--they run on the same track, so you could run your locomotive as soon as it gets to you. The trains come in installments, and you probably want to have as much train as possible for the holidays or any other special occasions, such as birthdays or holidays. The trains are not available indefinitely. Every October I start hearing from frantic people wanting to get a whole subscription train right now or asking for help tracking down trains they had put off ordering until the series was closed. 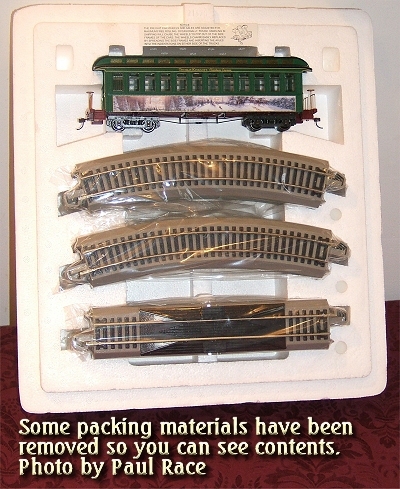 Though I've tried hard to help everyone who has contacted me with "special circumstances," the truth is, I can't get these trains shipped from the manufacturer any faster than you can, and only a tiny percentage of these trains ever become available on the resale market at less than "scalping" prices. In other words, if you're pretty sure you'd like one of these, you should order now to avoid disappointment. (All trains come with a return privileges and a warranty.) Though I frequently hear from people who are disappointed that they missed out on a set they waited too long to order, I haven't heard from one person who was disappointed with his or her train. On the contrary, I've heard from many people who were delighted with them. Please contact me if you have any questions that aren't answered on these pages. Note: Family Garden Trains(tm), Big Christmas Trains(tm), Big Indoor Trains(tm), Big Train Store(tm), Garden Train Store(tm) and Trains and Towns(tm) are all trademarks of Breakthrough Communications (www.btcomm.com). All information, data, text, and illustrations on this web site are Copyright (c) 1999, 2000, 2001, 2002, 2003, 2004, 2005, 2006, 2007 by Paul D. Race. Reuse or republication without prior written permission is specifically forbidden.